Everything we love about New England is better by bike. When you’re on two wheels, the air is crisper, the small towns lovelier, the coast a bit more like heaven, and the wild blueberries may even be sweeter. 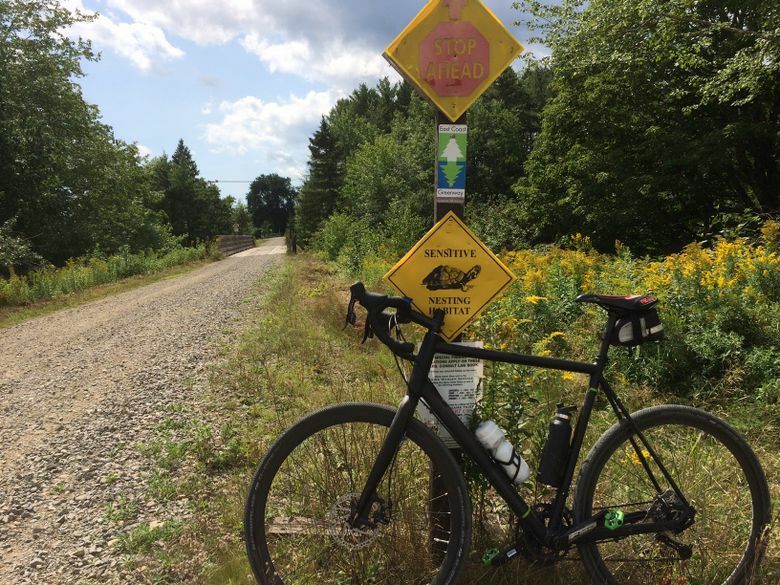 Last summer, when I found myself without a bike while visiting family in Vermont, I rented one at Omer and Bob’s Sportshop in nearby Lebanon, New Hampshire, and rode part of the Northern Rail Trail. I pedaled on flat, easy terrain through a tunnel of brilliant green trees and detoured to a sparkling lake. Since then, I’ve started jotting down names of other trails in the region that I want to bike this summer — and probably many summers hence, by the length of my list. If you’re not sold yet, just wait until the muggy season hits the Mid-Atlantic, and New England will be calling your name rather convincingly. Below are suggested routes by state — a mere sampling of biking trails in the region — followed by helpful links and tips for renting and riding. Begin here, but detour often. The East Coast Greenway begins in Calais, Maine, at the Canadian border. The 87-mile Down East Sunrise Trail, on former logging roads in the Moosehorn National Wildlife Refuge (you may see moose from afar), is the longest continuous stretch of Greenway to date. The route is stunning, passing through primeval forests and storybook villages; don’t be surprised if you cover miles before you encounter another human. But keep in mind, this stone dust-trail is the only Greenway route that allows ATVs. If you hear one, pull over and yield to the motor. In Portland, rent a bike at Gorham Bike and Ski, and hop onto the Eastern Trail, also part of the Greenway, in South Portland. The majority of Gorham’s rental customers bike down the coast and hit Portland Head Light, the lighthouse in Cape Elizabeth’s Fort Williams Park. From there, take the marked trail to Old Orchard Beach, Kennebunk and — if you’re ambitious — all the way to Portsmouth, New Hampshire and back — about 100 miles. Range Morton, a manager at Gorham, also recommends exploring the islands of Casco Bay by bike; the largest, Peaks Island, is a 17-minute ferry ride away. If you love lobster rolls, Morton suggests stopping at the no-frills Lobster Shack in Cape Elizabeth or the new Highroller Lobster in Portland. Gorham has additional rental locations along the trail in Saco and Kennebunk. 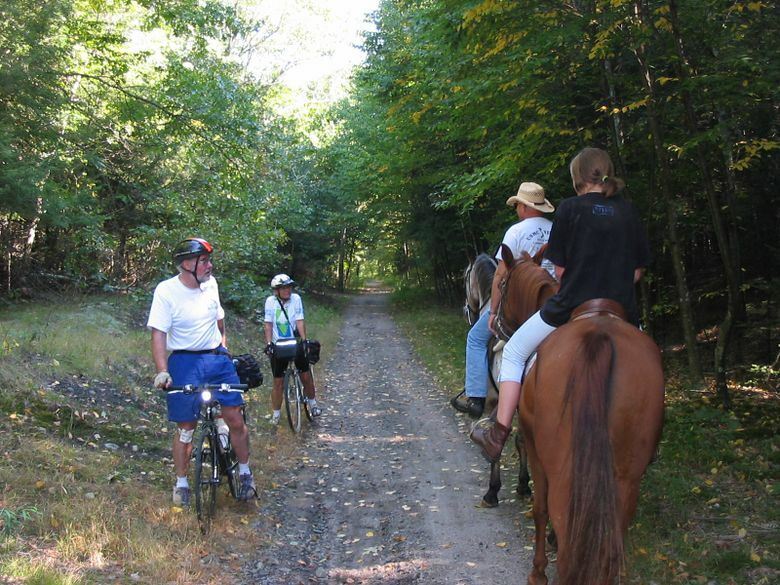 The Northern Rail Trail is built on the old railroad bed of the Boston and Maine Railroad’s Northern Line. The path begins in Lebanon, close to the Vermont border, and stretches 58 miles through Enfield, Canaan, Danbury and Andover, ending just past Boscawen. “It’s hard to do an extensive ride here and stay away from hills, but the rail trail isn’t hilly, it’s very scenic, and it’s away from cars,” said Jonathan Wilmot, a manager at Omer and Bob’s Sportshop. The shop is a parking lot away from the start of the trail, which has a crushed-rock surface. The section closest to Lebanon is the most scenic (and busiest), following the Mascoma River and passing Mascoma Lake about four miles from the shop. In Enfield, stop for lunch at Mickey’s Restaurant & Tavern. If you make it to Danbury, the Country Store offers picnic provisions. If the flat rail trails leave your legs begging for more, head to the hills. Franconia Notch is a breathtaking mountain pass in the popular White Mountain National Forest, and Franconia Notch Bike Path is a nine-mile trail within the state park. The path is paved and hilly, with an approximately 800-foot elevation gain from south to north. To bike in the mountains without actually climbing, start at the base of the aerial tramway (which takes visitors to the 4,080-foot summit of Cannon Mountain for views of New York, Maine and Canada) and ride downhill to the Flume Gorge at the base of Mount Liberty. You can catch a shuttle back to the tram from Sport Thoma ski shop, which also rents bikes. Last August, I was in Burlington and somehow missed what must be one of the country’s most spectacular bike trails: the Island Line Trail. 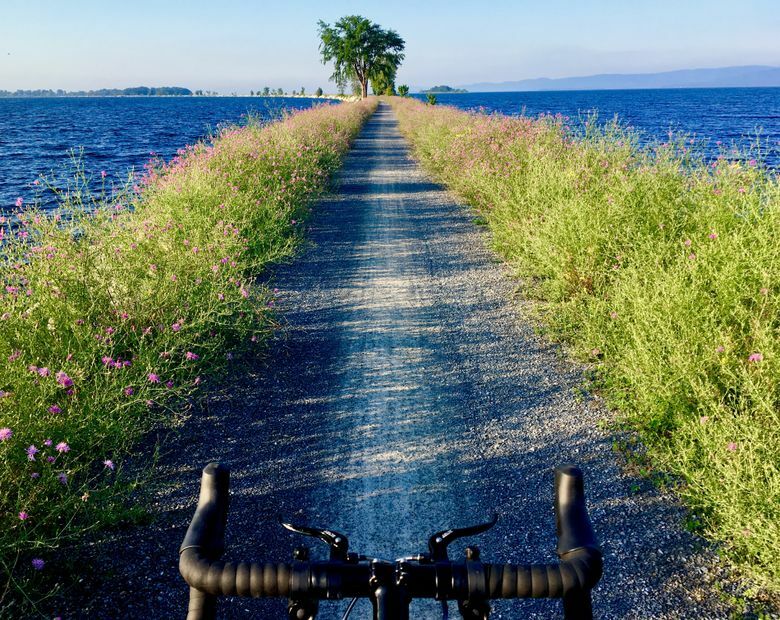 The 14-mile, kid-friendly route, which is part of the Lake Champlain Byway, is now high on my list; it follows Burlington’s waterfront and continues smack into the middle of the lake. Cyclists ride an old railroad causeway (once used to export granite out of the state) and take in an awesome panorama from the middle of Lake Champlain, with the Adirondacks to the West and Green Mountains to the east. (I’ve heard the view’s even better at sunrise and sunset.) The causeway continues nearly across the lake, save a 200-foot gap for boats. That’s where you walk your bike onto the bike ferry (naturally) to continue on the trail. Ross Saxton, a manager at Local Motion, an advocacy organization that has a trailside bike-rental shop, suggests crossing the lake to South Hero and pedaling to Hackett’s Orchard, where you can fill your backpack with apples, or Snow Farm, the state’s oldest grape winery (with its own vineyard). On the Burlington side, explore Colchester Bog Natural Area and Rossetti Beach Natural Area, then hit Switchback Brewing for lunch. For a longer bike, try the 40-mile triple ferry loop, which dips into New York. When the Lamoille Valley Rail Trail is complete, it will run 93 miles through 18 communities across northern Vermont, making it the longest rail trail in New England. The scenic path is on the right of way of the former St. Johnsbury and Lake Champlain Railroad, and passes through the spine of the Green Mountain range. Currently, two sections are open: Section 1A is 15 miles, winding through farmlands and forests of Caledonia County; Section 1B is 17 miles, following the Lamoille River and connecting to the Greenway in Cambridge. In Boston, the Greenway follows the Charles River Bike Path for 12 miles, past the Museum of Science and the Charles River Museum of Industry & Innovation in Waltham. The path is heavily used by cyclists, as well as runners and walkers, who share the scene with rowers and sailors on the river. Visitors to Cape Cod can try the Cape Cod Rail Trail, a newly expanded, 26-mile paved path that passes through a half-dozen coastal towns, from Wellfleet, near Cape Cod National Seashore, southwest almost to Yarmouth. Rail Trail Bike & Kayak, which has a rental fleet of 100 bikes and a website that details stops along the trail, is located roughly in the middle, near Nickerson State Park. Dan Poitras, who owns the shop, said vacationers often bike around the Cape and never get in their cars. “There’s something for everyone – cranberry bogs, state parks and forests, beautiful views, small towns, beaches, the Three Sisters lighthouses,” he said. “The bike trail creates accessibility to certain beaches without traffic.” For fueling up, he suggests Eat Cake 4 Breakfast Bakery near his shop or Arnold’s Lobster & Clam Bar in Eastham. For the adventurous: Bike the rail trail to Provincetown, board the ferry, then pedal along the Charles River in Boston. 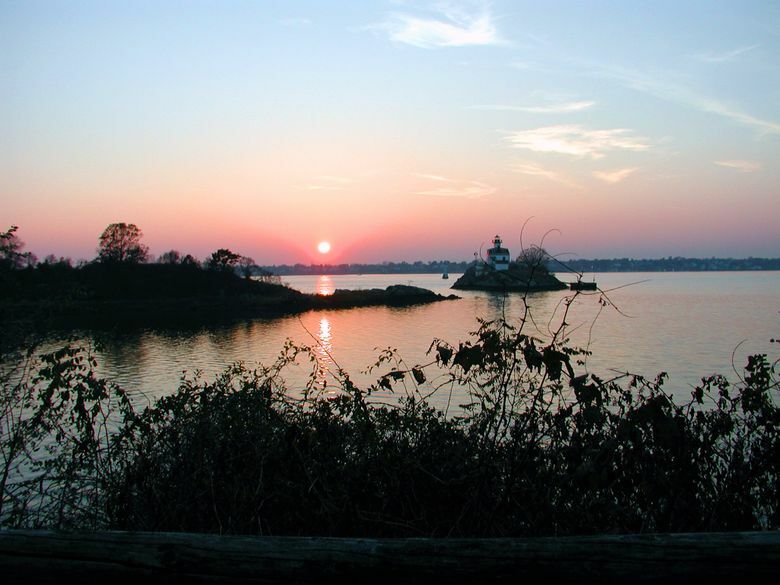 The Ocean State has an impressive network of bike paths and no shortage of killer water views. The Blackstone River Bikeway runs north and south for almost 12 miles, a continuous path that experienced cyclists can ride (on- and off-road) for an additional five miles to India Point Park in Providence, at the head of Narragansett Bay. The trail follows the Blackstone River and Blackstone Canal with views of waterfalls, marshes and wildlife, including great blue herons, cormorants, ospreys, eagles, foxes and muskrats. From India Point Park, at the confluence of the Seekonk and Providence rivers, the mostly flat, 14.5-mile East Bay Bike Path follows the footprint of the former Providence, Warren and Bristol Railroad. “It’s quite a treat to bike into historic Providence from the East Bay Bike Path and enjoy views of sailboats on the Narragansett Bay,” said Dennis Markatos-Soriano, the East Coast Greenway’s executive director. The Greenway in Rhode Island also includes the Blackstone River Greenway and the Washington Secondary Bike Path, which has 19 miles of continuous off-road trail. For bike rentals, head to Dash Bicycle Shop or NBX Bikes, which has four locations. The Farmington Canal Heritage Greenway is one of the favorite rides in New England’s southernmost state. The nearly completed trail, part of the East Coast Greenway, runs for 47 miles in central Connecticut and extends to Northampton, Mass. Greenway Alliance’s Donald recommends starting in Simsbury for a “flat, scenic and historic” 28-mile loop passing through five towns in the Farmington River Valley. The loop is all paved and offers access to small downtown areas with restaurants and inns. Air Line State Park Trail begins in East Hampton and stretches to the eastern part of Connecticut, along the 1870s rail bed. Cyclists on this path — named because it was part of a straight run between Boston and New York — pass waterfalls and cross viaducts, sharing the path with hikers and horseback riders. In the southern section, East Hampton to Colchester and back is a 22-mile spin. Take the trail all the way to Thompson, in the northeast corner of the state, for a ride that tops 40 miles. Rent bikes at Pedal Power, which has four locations. If one of these excursions calls out to you, contact the bike shop ahead of time to inquire about rentals – availability, types of bikes offered and what’s included. Prices vary depending on the length of rental and whether you want kids wheels, a high-end road bike or something in between. Rentals typically come with a helmet, lock and water-bottle cage, sometimes with a pouch, lights and a car rack. I generally find bike-shop staffers to be helpful and kind. Ask them about local rides, local eats and local weather when planning your trip. Many shops offer free local cycling maps. When it comes time for your ride, wear padded shorts if you’re doing any distance. Drink plenty of water ahead of time and while you’re cycling to prevent dehydration. A small pack is useful for things such as a phone, camera, snacks, sunscreen, a towel for beach detours and a windbreaker if the weather’s iffy. I’d suggest bringing credit cards for bike-shop deposits and greenbacks for country stores, ice cream parlors, sandwich shacks and ferries that don’t take plastic. Follow bike-trail etiquette: Ride on the right unless passing, and give an audible signal when you do pass. Stop at all stop signs; slow down and use extra caution around dogs, kids and pedestrians; err on the side of safety and walk your bike in heavily congested areas.